A frame is a window whose size and position can (usually) be changed by the user. It usually has thick borders and a title bar, and can optionally contain a menu bar, toolbar and status bar. A frame can contain any window that is not a frame or dialog. A frame that has a status bar and toolbar, created via the CreateStatusBar and CreateToolBar functions, manages these windows and adjusts the value returned by GetClientSize to reflect the remaining size available to application windows. wxEVT_MENU_HIGHLIGHT: the default implementation displays the help string associated with the selected item in the first pane of the status bar, if there is one. wx.DEFAULT_FRAME_STYLE: Defined as wx.MINIMIZE_BOX | wx.MAXIMIZE_BOX | wx.RESIZE_BORDER | wx.SYSTEM_MENU | wx.CAPTION | wx.CLOSE_BOX | wx.CLIP_CHILDREN. wx.ICONIZE: Display the frame iconized (minimized). Windows only. wx.CAPTION: Puts a caption on the frame. Notice that this flag is required by wx.MINIMIZE_BOX, wx.MAXIMIZE_BOX and wx.CLOSE_BOX on most systems as the corresponding buttons cannot be shown if the window has no title bar at all. I.e. if wx.CAPTION is not specified those styles would be simply ignored. wx.MINIMIZE: Identical to wx.ICONIZE. Windows only. wx.MINIMIZE_BOX: Displays a minimize box on the frame. wx.MAXIMIZE: Displays the frame maximized. Windows and GTK+ only. 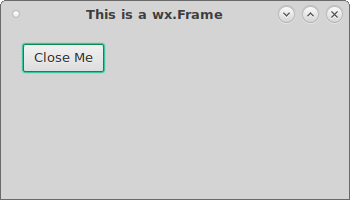 wx.MAXIMIZE_BOX: Displays a maximize box on the frame. Notice that under wxGTK wx.RESIZE_BORDER must be used as well or this style is ignored. wx.CLOSE_BOX: Displays a close box on the frame. wx.STAY_ON_TOP: Stay on top of all other windows, see also wx.FRAME_FLOAT_ON_PARENT. wx.SYSTEM_MENU: Displays a system menu containing the list of various windows commands in the window title bar. Unlike wx.MINIMIZE_BOX, wx.MAXIMIZE_BOX and wx.CLOSE_BOX styles this style can be used without wx.CAPTION, at least under Windows, and makes the system menu available without showing it on screen in this case. However it is recommended to only use it together with wx.CAPTION for consistent behaviour under all platforms. wx.RESIZE_BORDER: Displays a resizable border around the window. 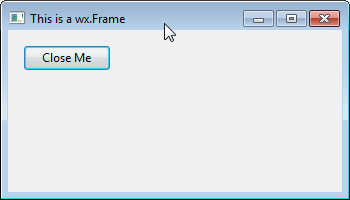 wx.FRAME_TOOL_WINDOW: Causes a frame with a small title bar to be created; the frame does not appear in the taskbar under Windows or GTK+. wx.FRAME_NO_TASKBAR: Creates an otherwise normal frame but it does not appear in the taskbar under Windows or GTK+ (note that it will minimize to the desktop window under Windows which may seem strange to the users and thus it might be better to use this style only without wx.MINIMIZE_BOX style). In wxGTK, the flag is respected only if the window manager supports _NET_WM_STATE_SKIP_TASKBAR hint. wx.FRAME_FLOAT_ON_PARENT: The frame will always be on top of its parent (unlike wx.STAY_ON_TOP). A frame created with this style must have a not None parent. wx.FRAME_SHAPED: Windows with this style are allowed to have their shape changed with the SetShape method. 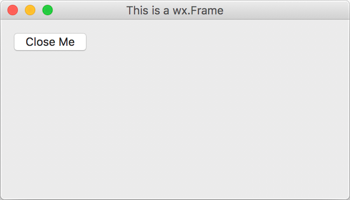 wx.FRAME_EX_METAL: On Mac OS X, frames with this style will be shown with a metallic look. This is an extra style. EVT_CLOSE: Process a wxEVT_CLOSE_WINDOW event when the frame is being closed by the user or programmatically (see wx.Window.Close ). The user may generate this event clicking the close button (typically the ‘X’ on the top-right of the title bar) if it’s present (see the CLOSE_BOX style). See wx.CloseEvent. EVT_ICONIZE: Process a wxEVT_ICONIZE event. See wx.IconizeEvent. EVT_MENU_OPEN: A menu is about to be opened. See wx.MenuEvent. EVT_MENU_CLOSE: A menu has been just closed. See wx.MenuEvent. EVT_MENU_HIGHLIGHT: The menu item with the specified id has been highlighted: used to show help prompts in the status bar by wx.Frame. See wx.MenuEvent. EVT_MENU_HIGHLIGHT_ALL: A menu item has been highlighted, i.e. the currently selected menu item has changed. See wx.MenuEvent. 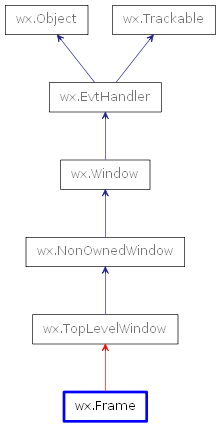 An application should normally define an wx.CloseEvent handler for the frame to respond to system close events, for example so that related data and subwindows can be cleaned up. Centre Centres the frame on the display. Create Used in two-step frame construction. CreateStatusBar Creates a status bar at the bottom of the frame. CreateToolBar Creates a toolbar at the top or left of the frame. GetClientAreaOrigin Returns the origin of the frame client area (in client coordinates). GetMenuBar Returns a pointer to the menubar currently associated with the frame (if any). GetStatusBar Returns a pointer to the status bar currently associated with the frame (if any). GetStatusBarPane Returns the status bar pane used to display menu and toolbar help. GetToolBar Returns a pointer to the toolbar currently associated with the frame (if any). OnCreateStatusBar Virtual function called when a status bar is requested by CreateStatusBar . OnCreateToolBar Virtual function called when a toolbar is requested by CreateToolBar . ProcessCommand Simulate a menu command. SetMenuBar Tells the frame to show the given menu bar. SetStatusBar Associates a status bar with the frame. SetStatusBarPane Set the status bar pane used to display menu and toolbar help. SetStatusText Sets the status bar text and redraws the status bar. SetStatusWidths Sets the widths of the fields in the status bar. SetToolBar Associates a toolbar with the frame. parent (wx.Window) – The window parent. This may be, and often is, None. If it is not None, the frame will be minimized when its parent is minimized and restored when it is restored (although it will still be possible to minimize and restore just this frame itself). id (wx.WindowID) – The window identifier. It may take a value of -1 to indicate a default value. title (string) – The caption to be displayed on the frame’s title bar. pos (wx.Point) – The window position. The value DefaultPosition indicates a default position, chosen by either the windowing system or wxWidgets, depending on platform. size (wx.Size) – The window size. The value DefaultSize indicates a default size, chosen by either the windowing system or wxWidgets, depending on platform. style (long) – The window style. See wx.Frame class description. name (string) – The name of the window. This parameter is used to associate a name with the item, allowing the application user to set Motif resource values for individual windows. For Motif, MWM (the Motif Window Manager) should be running for any window styles to work (otherwise all styles take effect). Centres the frame on the display. direction (int) – The parameter may be wx.HORIZONTAL, wx.VERTICAL or wx.BOTH. Used in two-step frame construction. See wx.Frame for further details. Creates a status bar at the bottom of the frame. number (int) – The number of fields to create. Specify a value greater than 1 to create a multi-field status bar. style (long) – The status bar style. See wx.StatusBar for a list of valid styles. id (wx.WindowID) – The status bar window identifier. If -1, an identifier will be chosen by wxWidgets. name (string) – The status bar window name. A pointer to the status bar if it was created successfully, None otherwise. The width of the status bar is the whole width of the frame (adjusted automatically when resizing), and the height and text size are chosen by the host windowing system. Creates a toolbar at the top or left of the frame. style (long) – The toolbar style. See wx.ToolBar for a list of valid styles. id (wx.WindowID) – The toolbar window identifier. If -1, an identifier will be chosen by wxWidgets. name (string) – The toolbar window name. A pointer to the toolbar if it was created successfully, None otherwise. By default, the toolbar is an instance of wx.ToolBar. To use a different class, override OnCreateToolBar . When a toolbar has been created with this function, or made known to the frame with wx.Frame.SetToolBar , the frame will manage the toolbar position and adjust the return value from wx.Window.GetClientSize to reflect the available space for application windows. Under Pocket PC, you should always use this function for creating the toolbar to be managed by the frame, so that wxWidgets can use a combined menubar and toolbar. Where you manage your own toolbars, create a wx.ToolBar as usual. Returns the origin of the frame client area (in client coordinates). It may be different from (0, 0) if the frame has a toolbar. Returns a pointer to the menubar currently associated with the frame (if any). Returns a pointer to the status bar currently associated with the frame (if any). Returns the status bar pane used to display menu and toolbar help. Returns a pointer to the toolbar currently associated with the frame (if any). Virtual function called when a status bar is requested by CreateStatusBar . number (int) – The number of fields to create. style (long) – The window style. See wx.StatusBar for a list of valid styles. id (wx.WindowID) – The window identifier. If -1, an identifier will be chosen by wxWidgets. name (string) – The window name. An application can override this function to return a different kind of status bar. The default implementation returns an instance of wx.StatusBar. Virtual function called when a toolbar is requested by CreateToolBar . An application can override this function to return a different kind of toolbar. The default implementation returns an instance of wx.ToolBar. id (int) – The identifier for a menu item. menuBar (wx.MenuBar) – The menu bar to associate with the frame. If the frame is destroyed, the menu bar and its menus will be destroyed also, so do not delete the menu bar explicitly (except by resetting the frame’s menu bar to another frame or None). Under Windows, a size event is generated, so be sure to initialize data members properly before calling SetMenuBar . Note that on some platforms, it is not possible to call this function twice for the same frame object. Associates a status bar with the frame. If statusBar is None, then the status bar, if present, is detached from the frame, but not deleted. Set the status bar pane used to display menu and toolbar help. Using -1 disables help display. Sets the status bar text and redraws the status bar. text (string) – The text for the status field. number (int) – The status field (starting from zero). Use an empty string to clear the status bar. Sets the widths of the fields in the status bar. widths (list of integers) – Must contain an array of n integers, each of which is a status field width in pixels. A value of -1 indicates that the field is variable width; at least one field must be -1. You should delete this array after calling SetStatusWidths . Associates a toolbar with the frame.